Ever look at old family photos? You remember, the faded picture with the brown couch, wood panel walls and yellow(ish) shag carpet. Most people look at the photo and see these things and the smiling faces of the family. We look at these photos and are taken back to a time when another generation set the rules. But looking a little more closely at the photo of years gone by, you might notice something that is still around the old house and room today. Hidden in the photo, but still prominent in the room where the photo was taken, is that old, painted over two prong outlet. You know the one. It had the gaudy horse-carved table lamp plugged into it. At one time it was white but it was painted to match the wall color when the paneling came down and the sheet rock went up. You changed the entire look and feel of the living room over the years but that outlet stayed the same. And, why not? It only served one function and how often does technology change, right? The two prong outlets had been the norm for so long and years of remodeling and redecorating never seemed to affect the outlets. No upgrades were required. Just slap a new cover on it and it was good to go. When “new technology” came about, we were ready with the “cheater” outlet that still enabled us to use three prong electronics with the old two prong outlets. But soon everything seemed to require three prong outlets and that left us having an abundance of those grey three-to-two prong adaptors in our junk drawer. Old photos are great to look at and reminisce about past times. But, we are constantly changing and our technology is expanding at a rapid rate. Modern times call for modern outlets. Two prong outlets had a good run and they served a valuable purpose, but there comes a day when the grandfather, who led the head of the family for years, has to retire and give way to change and a new way of doing things. Outlet changes should be made because today’s outlets give us piece of mind, safety and convenience. Safety has been a top priority for new outlet designs. All modern homes, those built after 2008, should have child-proof outlets installed. It’s unfortunate that every night we turn on the local news we are confronted with the rising number of burglaries. Using a common-sense approach to home defense can improve security and provide increased protection for your family and possessions. Burglars have one main goal: Don’t get caught. To avoid detection, stay in the shadows. Security lighting can ruin a burglar’s day. While burglaries do take place during the day, night time is still the best cover. When looking to make your house less targetable, one of the easiest solutions is lighting, both indoor and outdoor. If you make it appear that someone is home, burglars are more likely to pass by without a second glance. Shedding light outside the house is also a deterrent. Inside, establish a routine and stick with it. Some burglars will case a target to pinpoint vulnerabilities, such as the occupants going out of town. A timer can disguise your absence. Set the lights to turn on at a certain time in the morning and off at a set time at night. Make sure to turn on more than just one light. Intruders see only one light almost as if it’s a homing beacon for absence. If you use several lights with timers it will be harder for a burglar to tell when you’re gone, whether you’re on a trip, or if you are just working late. It’s also beneficial to use timers even when you are at home. This will maintain a routine and could possibly cut down on energy use. Outdoors, it’s all about visibility. The area immediately outside of your home is the first line of defense. Yard lights (both front and back) are great, but solar lights are probably too dim to do much in the way of security. 120-volt lights are better, and should be placed at strategic points such as entries, above garage doors, and walkways. Exterior lighting needs to bright enough for you to see 100-feet and it helps if you can identify colors. Good lighting is definitely a deterrent to criminals because they don’t want to be seen or identified. Any hiding spots, like clusters of trees or freestanding structures, should also be well-lit. If you’re concerned about efficiency, most lights can be hooked up to motion detectors so they only turn on when needed. Researching and implementing effective security lighting for your home will provide increased protection and peace of mind. Practical consumers know the importance of checking reviews, warranties and return policies before making a purchase. For more information and ideas on security lighting, contact Northern Electric & Automation Today. Power Surge Protection ??? Your power strip is not safe! If you’ve got power strips all over your home and you think you’re protected, you may want to think again! If lighting strikes near your home, a surge of electricity can travel right through the wiring of your home— this wave of electricity can do some serious damage. It can permanently disable your most expensive home appliances, including your washers, dryers, refrigerators, televisions and computers. Power surges usually only last a few seconds or less, and are for the most part, harmless. But power strikes caused by downed power lines or even lighting strikes can be absolutely devastating, sending thousands upon thousands of volts throughout your home. A surge like this can result from a simple change in electricity from a nearby factory or the cycling of your appliances. Your expensive electrical appliances are all too valuable to risk losing them to the devastating effects of a power surge. While major surges can start a fire, just a minor surge can do damage that cannot be fixed. If you have a whole house surge protector installed, you can bet that your risks of damage will be significantly reduced, even when you’re on vacation. Installing whole house surge protection in your home will not only offer you peace of mind, but you can actually add value to your home with this new addition to your property. That’s why Northern Electric & Automation, LLC offers complete power surge protection for your entire home or business. It’s completely reliable and affordable for nearly any budget. Contact us today for a quote. Incadescent vs. Fluorescent: Which Should You Choose and Why? At NAE Electric & Automation, we specialize in all things electricity related. If there is a job for us to do, we’d love to take it on. However, service doesn’t always come with a price. Being a customer-centered company is incredibly important to us. That’s why we provide tips and guides online at no cost to you. This guide focuses on the difference between incandescent and fluorescent bulbs in an effort to provide you with the most efficient type of home lighting system. Incandescent bulbs are what you think of when you think of a light bulb. They pop up over people’s heads when they get a good idea. Not literally, but you know what we mean. Incandescent light bulbsproduce a yellowish type of light. Most incandescent bulbs are incredibly affordable and range anywhere from 15-150 watts. One very beneficial caveat of incandescent lights is their versatility; not only in wattage, but in shape as well. Customers are able to purchase a standard-shaped light bulb, a version shaped as a globe, and some incandescents even come in the shape of a candle flame. On the other end of the spectrum, we find fluorescent bulbs. In recent years, there has been a large push to get consumers to move towards fluorescent light bulbs, and you are about to find out why. While requiring more of an initial investment, fluorescent bulbs are much cheaper to power than incandescent bulbs. Fluorescent bulbs can use up to 67% less energy than incandescent bulbs and even last longer in the process! Fluorescent bulbs are also able to use less wattage than standard incandescent bulbs while providing the same amount of light. Despite these benefits, there are downsides to each type of bulb. As previously mentioned, incandescent bulbs are not energy efficient. Although they might be easy on the wallet at the store, this is not the case on your electrical bill. And while fluorescent bulbs do save money on your electrical bill, they require more cash up front. In order to make an educated decision, it’s imperative that you decide what is important to you as a consumer. If you are looking to save cash in the long run, fluorescent bulbs enable you to do that simply and effectively. However, if you are looking to use a light bulb that is safer for the environment, but may cost a little more cash, then incandescent bulbs are for you. Electricity doesn’t always have to be a complicated subject. While there are some instances in which you must call your local master electrician, there are many questions that can be answered with a little research and determination. Choosing a type of light bulb is not likely to be an incredibly difficult decision, but diving into the endeavor with some extra information will always prove to be helpful. If you’ve got bigger problems to deal with than a simple light bulb switch-up, then contact us at Northern Electric & Automation, we’d love to help. Daily life would be unthinkable without the availability of electricity. While the occasional power outage reminds us that candles and barbecue grills are poor substitutes for reading lamps and microwaves, prolonged problems with a home’s electrical system have the potential to cause significant interruptions in daily living. There are three steps to ensuring that you will enjoy continued access to electricity in all situations. A system inspection is the first step to enjoying your home’s electricity safely and with a minimum of interruptions. Walk through your rooms and take note of your outlets. Are there some that do not support any electrical appliances? Are there others that seem to have one or more extension cords plugged in? If so, you are looking at an unbalanced use of the home’s circuits. Extension cords – although handy – should be a temporary fix rather than a permanent solution to your power needs. If you are uncertain about your circuit loads, give Eric at NAE a call. He would gladly come out and do a system inspection for you. If you discover that you have outgrown your available number of outlets and circuits, we can easily install new circuits and outlets to power your new appliances. In the alternative, consider a reduction of any appliances that are currently plugged in. Are there some machines that you do not really use all the time? Perhaps you could store them in a cabinet or at least unplug them until you have a need for them. This frees up not only useful counter space but also opens up some much-needed outlet space. Of course, there comes a time when a professional should be consulted. This free electrical safety checklist highlights the occasions when NAE not only ensure your continued enjoyment of electrical power but also your continued safety. Dimming lights. If your lights occasionally flicker or dim, you may be looking at light bulb troubles. If this problem affects all lamps plugged into a circuit, you may be looking at wiring problems. This is a job for the professional. Outlet troubles. Does your outlet feel warm or even hot to the touch? Are the edges somewhat discolored? Do you notice sparks coming from the outlet? You could be dealing with frayed wiring, which is a serious fire hazard! Do not let another day go by without calling a professional. Protect your safety by not using the outlet until after you get it fixed. Appliance troubles. Does it seem like every toaster that is plugged into a certain outlet seems to break right away? Do you get a bit of a tingle when you touch an appliance? Does the coffeemaker have a burning smell when you turn it on? Sure, you could have bad luck with your appliances. Then again, you might be encountering uneven power flows that are causing your appliances to burn. An electrician is able to quickly ascertain where the trouble lies. By the way, if you lose electricity every time a storm hits, let us know. We can easily install a BACK-UP GENERATOR that powers selected circuits in your home. Never lose another refrigerator or freezer filled with food again! As spring-cleaning time approaches, don’t forget to add “electrical safety” to your annual checklist. Chasing dust bunnies is a worthy goal, but protecting your family and home is one of the most important chores you’ll ever tackle. Keep power cords and electrical equipment away from moisture. Making contact with charged water is more than dangerous; it is life threatening. If you accidentally drop a dryer or other plugged-in appliance into the water, NEVER unplug it or pick it up before shutting off electricity to the proper circuit. Allow the device to dry for a few days and have an electrical professional examine the appliance to determine if it is still safe and functional. Call before you dig. Prevent damage to underground electrical equipment and avoid potential injury by making sure you are safe to dig. New Hampshire and Massachusetts law requires residents to call at least three full business days before digging. Dial 811 to be connected to Dig Safe. Plug countertop appliances into GFCIs. Should an appliance malfunction or fall into the water, the GFCI shuts off electricity to the appliance before electrical shock can occur. Check electrical devices for UL labels. Underwriters Laboratories certifies the safety of electrical devices, but the appliance and electrical market has seen a growing number of counterfeit UL labels. Look for the UL label on your devices, and read this article by Underwriters Laboratories to learn how to spot a fake label. Clean your exhaust hood after a long winter of indoor cooking. Food particles, dust, and oil buildup encourages bacteria growth and is a potential fire hazard. Remove and clean the hood filter, and use a degreaser to clean exposed surfaces. Vacuum the coils behind your refrigerator. Dirt buildup contributes to appliance inefficiency and is also a potential fire hazard. Carefully clean the coils every few months. When you return the refrigerator to its proper place, leave room behind it for air to safely circulate. Clean dryer ducts. Dryer fires are a major hazard that can be avoided by cleaning the interior and exterior of your dryer hose each year. Every six months, inspect the dryer vent for clogs and lint buildup. There are many professional HVAC companies that provide a thorough dryer vent inspection and cleaning if you are unable to do this, yourself. Check lamp and fixture wattages while you are dusting. Bulb wattages should be equal to or less than manufacturer recommendations, which are listed on the individual fixture. Check power strips and surge suppressors. These electrical devices are designed to manage a specified electrical load. Avoid plugging too many items into the same outlet, which may cause a circuit overload or lead to a fire. Schedule an electrical inspection. Inspections are especially important for homeowners moving into or out of a new home. Northern Automation and Electric can perform visual inspections, inspects circuit panels, and brings all electrical systems up to date with code corrections. According to the U.S. Fire Administration (USFA), the risk of electrical fire is a big concern for homeowners. Over 28,600 annual electrical fires lead to 310 deaths, 1,100 injuries, and more than $1 billion in property loss and damages. At NAE Automation and Electric we educate the community about electrical safety so families can feel secure in their homes. View our FREE SAFETY CHECKLIST and information about preventing generator hazards, putting out electrical fires, and keeping children safe around electricity. To schedule an electrical inspection or discuss safety concerns contact Eric at Northern Automation and Electric 603-662-2108 today! Many appliances use electricity even when they aren’t powered on. This property is known as standby power, which is used to perform functions that must operate continuously. Energy saving measures often include unplugging electrical devices to eliminate the cost of keeping them in standby mode. This strategy requires you to estimate the cost of standby power for each appliance since it may not be worthwhile to unplug a device when it is not in use. A year is about 8,766 hours long, so a month has an average duration of about 730.5 hours. This means you can multiply an appliance’s standby power in watts by 0.73 to obtain the kilowatts of energy it consumes each month, assuming it is always plugged in. A typical cost of electricity in the United States is 10 cents per kilowatt-hour. You can therefore estimate the standby cost of an appliance in dollars by multiplying its standby power consumption in watts by 0.0731. A satellite decoder draws about 12 watts in standby mode. It costs 12 x 0.0731 = $0.88 per month to keep a satellite decoder plugged in. A cable TV converter decoder draws about 11 watts in standby mode. It costs 11 x 0.0731 = $0.80 per month to keep a cable TV converter plugged in. A compact audio system draws about 9 watts in standby mode. It costs 9 x 0.0731 = $0.66 per month to keep a compact audio system plugged in. A video recorder draws about 6 watts in standby mode. It costs 6 x 0.0731 = $0.44 per month to keep a video recorder plugged in. A television set draws about 5 watts in standby mode. It costs 5 x 0.0731 = $0.37 per month to keep a television set plugged in. An inkjet printer draws about 5 watts in standby mode. It costs 12 x 0.0731 = $0.37 per month to keep an inkjet printer plugged in. A DVD player draws about 4 watts in standby mode. It costs 4 x 0.0731 = $0.29 per month to keep a DVD player plugged in. A microwave oven draws about 3 watts in standby mode. It costs 3 x 0.0731 = $0.22 per month to keep a microwave oven plugged in. A power tool draws about 2 watts in standby mode. It costs 2 x 0.0731 = $0.15 per month to keep a power tool plugged in. A video game console draws about 1 watt in standby mode. It costs 1 x 0.0731 = $0.07 per month to keep a video game console plugged in. Electricity is a staple in most homes today, and our reliance on it means that it’s important to learn how to handle it safely. Unfortunately, electrical fires and shocks aren’t as rare as you might think, but the good news is that most of them are completely preventable. By keeping a few basic ideas in mind, you can safeguard your home from electrical hazards and still enjoy helpful appliances and beautiful light fixtures! Most people know that water and electricity don’t mix, and yet many of us end up reaching for the hair dryer or electric razor after a shower as our hands are still wet. Do not touch electrical outlets or appliances with wet hands, and never reach into water to pull out an appliance that’s plugged in. Be very careful about outlets and electronics near water, including swimming pools. Any radios, TVs, phones, curling irons, hair dryers, radiators, lamps, and cords should be kept away from sinks, bathtubs, and pools filled with water. Completely dry hands and feet before touching electronics. Although they can be very helpful, do not use extension cords for a long period of time. They are designed for temporary applications, so unplug and safely store them between each use. Do not run extension cords through ceilings or walls, as it may cause them to overheat which can cause electrical fires. The Electrical Safety Foundation International (ESFI) reports that improper use of extension cords causes 3,300 residential fires each year. If you’re constantly needing a longer cord to plug in an appliance, you’re probably better off installing a new outlet. If you look around your home or office, you’ll notice that most outlets are located near the ground; this makes them convenient for plugging in electronics, but it also places them at a height accessible to children and animals. This doesn’t mean you have to move all your outlets, but there are a few simple changes you can make to keep your home and loved ones safe. Place plastic covers over outlets to prevent children from placing fingers or objects into the sockets. Plug-in covers are easy to find in any hardware store. Also make sure to keep loose cords away from pets, who may chew on them. You don’t need to cover them (this can actually lead to overheating) but securing cords or taping them down can prevent pets from playing with them. Never use cords that are corroded, melted, frayed, or have turned black. If a cord’s outer sheathing is torn or is exposing the wires within, you run a risk of shock, burn, or electrical fire. To prevent cord tears, always unplug appliances and electronics by pulling on the plug itself, not the cord. Additionally, do not try to “fix” run-down cords by taping the tears; just replace them or have a licensed electrician look at them if you’re unsure. Dealing with faulty cords is a tricky process that is best handled by a qualified professional. Your smoke alarms are one of the most important safety features in your home, but they’re useless if their batteries are dead. The National Fire Protection Association (NFPA) reports that approximately two-thirds of all home fire deaths occur in homes without working smoke alarms. With a statistic like this, it’s tough to argue against installing functional smoke alarms. Ideally, alarms should be placed in each bedroom/sleeping area and on the floor of every home. Check to make sure they’re working each month by pressing the “TEST” button located on the alarm. If your alarm is sounding off a single “beep” at periodic intervals (versus a constant beeping that indicates smoke detection), that means the batteries are failing and need to be changed immediately. Does one of these issues sound familiar to you? For residential and commercial electrical services in Massachusetts and New Hampshire call NAE Automation and Electric Today! Flickering lights do not always signify a serious issue with your electrical system. What’s more important to note is which lights flicker and how. This is a relatively common issue that can have a variety of explanations. To get a better idea of how to address your flickering lights, tailor your solution to the specific situation. If a single light bulb is flickering, then the issue likely begins and ends with that particular bulb. First, check to make sure that the light bulb is screwed in all the way (when bulbs get out of place, the connection with the socket is compromised). Sometimes it helps to unscrew the bulb completely and re-screw it back in to make sure it isn’t crooked or loose. For your safety, switch the light off before you do this. If the light is still flickering when turned back on, it could mean that this particular bulb is at the end of its lifespan and needs to be replaced altogether. If none of the above apply, try investigating the light switch itself next. Switch the light on and off a few times to see if the flickering dies down. If not, you may have a faulty switch that needs to be replaced by an electrician. Similarly, if you replace the bulb on a plug-in lamp and it still isn’t working, try plugging the lamp into a different outlet. It’s possible that the issue could be stemming from the socket. This type of issue should also be troubleshooted by a professional, as in-depth electrical work can be dangerous. When all the lights in your house are flickering, you may have a bigger problem on your hands. This can be caused by inclement weather, but if it is happening on a regular basis, your home’s voltage may be fluctuating. Take note of when the flickering happens and call an electrician to give them the details. You should have a professional take a look as soon as possible before further damage is caused. A third scenario is that your lights flicker for a moment immediately after being switched on, and then reach (and maintain) full illumination moments later. If you have fluorescent bulbs, this is completely normal. This occurs naturally in these types of lights and as long as the flicker stops after completing lighting up, there should be no issue. Many energy-saving bulbs take a few minutes to fully brighten. If the light bulb is a typical incandescent bulb, follow the suggestions in scenario 1. If you’re not sure what might be causing the problem, it’s wise to call NAE Automation and Electric to check it out. The tips above can help you narrow down what might be going on, but doing risky electrical work yourself isn’t recommended. Is Your Home a Fire Hazard? For millions of people ownership of a home is one of the perks of working hard and putting your pennies where they count. So, what happens when you home starts to age? For those who have purchased their home before the 1970’s it may be time to start taking a serious look at some key factors. To begin with you may want to first determine if that older home is becoming a fire hazard. To determine this there are some things you should be looking for that may be cause for concern. Here is a list of factors which may very well have the potential to cause health issues as well as fire hazards. Asbestos. Check the insulation in your home or better yet call in a professional to do an assessment. In older homes asbestos was commonly used as insulation, fire retardant and in textured paint. When it was first introduced this was thought of as an effective way of eliminating potential dangers that can arise however as studies concluded, this mineral fiber found in rocks and soil was found to cause Mesothilioma, a form of cancer. This cancer is potentially deadly and may take many years for symptoms to show up. If you believe your home may contain asbestos, contact a professional to check for it’s presence! Electrical Panels. Since this is an electrical blog, it is imperative to address issues which may arise from outdated electrical panels. Older homes commonly were equipt with older electrical panels. The types of panels installed were Federal Pacifica, Pushmatic and Zinsco. The bottom of the list on these panels is the Federal Pacifica which is prone to fires. So, if your electrical panel looks old, it very well may be one of the above listed. If you have one, call your local electrician and look to get the thing replaced! Foundation Issues. This is extremely important to fix considering radon can seep into the home through cracks and fissures. In older homes the presence of cracks in the foundation needs to be taken seriously. If you are finding cracks in your foundation it may be time to call a structural engineer. The damage caused by foundation cracks may be hazardous to your health! Smoke Alarms. Check to make sure you have smoke alarms in each room. Older homes particularly may be lacking in adequate smoke alarms. Smoke alarms should be present in each of the rooms, not just in the living room or kitchen. For an older home smoke alarms more often than not were installed hardwired. This means that if your smoke alarm consist of one or two old hardwired smoke alarms, it’s time to get it fixed. For an easy fix, battery operated alarms are easily found at any home improvement store. It’s best to have an electrician look at your smoke alarm system if in fact it is outdated! These are just a few things to look for if you have an older home that was built before 1970. As far as electrical safety is concerned it should be noted that some Federal Pacifica Panels were in fact installed after the year 1970 so it is advised to check your panel if you are in question as to whether or not you have one of these. Older homes are also at risk of fire if you have older knob and tube wiring which were installed dating back to the 1940’s and earlier. The presence of knob and tube wiring is an indicator of an outdated electrical system. 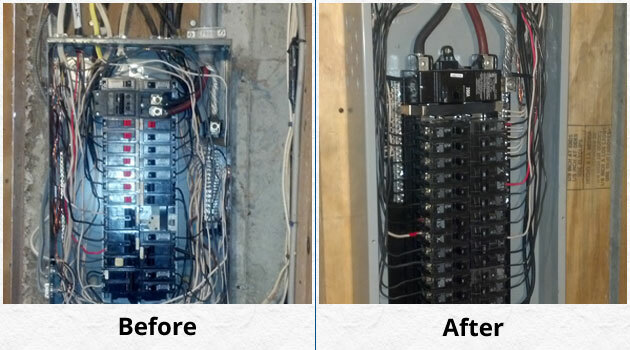 NAE Automation and Electric, LLC, performs electricdal work throughout Massachusetts and New Hampshire. We are the electricians to solve your electrical problems and meet yhour electrical requirments. Call or email us today.